We are very excited to announce our June Member of the Month! 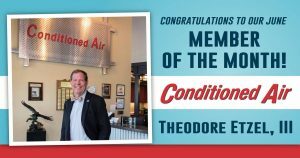 Theodore Etzel, III, CEO of Conditioned Air, has been a Service Roundtable member since 2004. His business has grown increasingly over the years, and we couldn’t be more proud! “During the time we have been members of Service Roundtable we have realized solid growth. We currently have 350 associates and revenues of $50+MM and are in our 56th year. Along with the fantastic rebate program that SRT affords us, we use the forum to keep up with trends in the industry, concerns to be aware of, what to do and what not to do, and the overall changing nature of the business world in which we operate. We consider our membership in SRT a very valuable resource for our success.” -Theodore Etzel, III, CEO of Conditioned Air.